Pro-life leaders gathered at Georgetown University for the 20th annual Cardinal O'Connor Conference on Life one day after the March for Life was held in Washington, D.C. Named after the former archbishop of New York, it is the largest collegiate pro-life conference in the United States, bringing together leading pro-life advocates and hundreds of students from around the country. 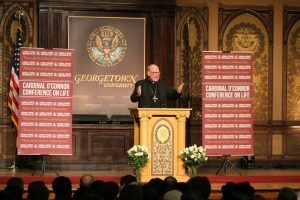 The conference opened with an invocation by Anthony Fisher, the archbishop of Sydney, Australia, and a keynote address by Timothy Cardinal Dolan, the current archbishop of New York. After his remarks, attendees had the opportunity to attend various breakout sessions featuring a diverse array of voices in the pro-life movement. O. Carter Snead, director of the Center for Ethics and Culture at the University of Notre Dame, spoke on "the future of American abortion jurisprudence" after the retirement of Justice Anthony Kennedy. Fr. Stephen Fields, S.J., a professor of philosophy at Georgetown University, discussed "abortion and the natural law." Aimee Murphy and Herb Geraghty from the nonprofit Rehumanize International gave a talk entitled, "Embracing the ‘F' Word: Learning to Love (Pro-Life) Feminism." Rehumanize International is a nonprofit and nonsectarian human rights organization dedicated to promoting the consistent life ethic, which entails a commitment to opposing aggressive violence against human beings in all stages of life, including abortion, unjust war, euthanasia, and torture. Geraghty expresses confidence that science is on the side of the pro-life movement. He finds it interesting when his friends "who are so into science" and passionate about environmental activism, which he supports, then call the baby inside a woman "a parasite or a clump of cells." "We know objectively that life begins at conception…. The question of abortion is not when does life begin. It's which human beings deserve human rights, and science can't tell us that. Science can't tell us that it's wrong to kill a baby, but [it] can tell us that this creature inside the womb is a genetically distinct, whole, living human organism which, in every other context, unless you're trying to commit genocide or violence against a group of people, you would call a person," Geraghty said. Star Parker, founder of the Center for Urban Renewal and Education (CURE), hosted a breakout session focused on abortion’s impact on the African-American community. "This is not a time for us to start promoting abortion. Abortion is a crime against humanity. We should not be doing it at all, ever. Similar to slavery, we've got to rid ourselves," Parker told the Free Beacon. Speaking about abortion's impact on African Americans, Parker said it has "become for the left … a part of their whole safety net discussion." "In addition to the moral and the medical and the mental implications to abortion, it feeds a narrative that we're victims, and so when people think that they're victim of their own even sexual impulses and they can't control them, then you end up with more abortion, and this message has been targeted specifically into the black community, an already vulnerable community, so women are getting caught up in this lie, and so we're disproportionately aborting our children," Parker said. After the breakout sessions, the conference featured a panel about "advancing a culture of life." 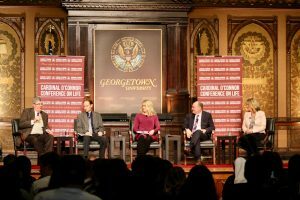 The panel consisted of five speakers, including George Weigel of the Ethics and Public Policy Center and Jeanne Mancini, president of the March for Life Education and Defense Fund. The day ended with a Mass for Life celebrated by Mario Dorsonville, an auxiliary bishop of Washington, in Georgetown's Dahlgren Chapel. 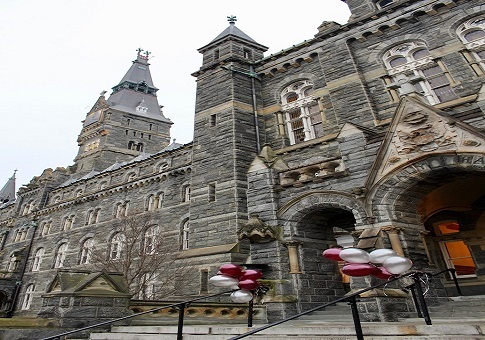 This entry was posted in Politics and tagged Abortion, Catholic Church, Georgetown. Bookmark the permalink.